I am always looking for healthy snacks for my daughter to much on. 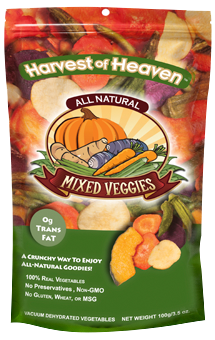 She is very picky and will only eat what she really likes, I am so glad I found Breezy Spring, Harvest of Heaven Chips! We are specialized in manufacturing healthy, tasty, and unique gourmet food products and we are enthusiastic about introducing them to our valued customers like you. 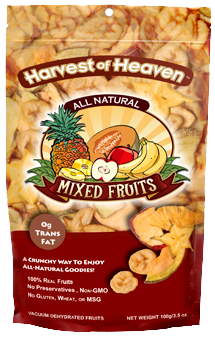 All-Natural Dehydrated Snacks, designed for active people, Harvest of Heaven Snacks provide a fast and creative alternative for daily fiber and nutrient intake. After the freshest ingredients are selected and then processed with the latest technology, we packaged them in our unique containers to preserve the crispness and freshness. Now you can enjoy all-natural goodies anytime, anywhere! Our high commitment to flavors and quality is recognized by many major retail chains, such as Whole Foods Market, Publix Supermarkets, Akins/Chamberlin’s, and Smoothie King stores. Many premium independent stores around the country also carry our products. It is our goal to serve more households and sharing more great wholesome products with health-conscious customers. I was very fortunate to be able to sample some of the great items from Breezy Spring, including some of the varieties of the Harvest of Heaven Chips. I was sent the, pineapple, sweet potato, shiitake mushroom, taro, green bean, mixed fruit chips and mixed veggies chips. And Bourbon chicken marinade, and Bourbon chicken grill & dip. My family were big fans of the chips! As soon as they arrived the dug right in and started trying them. My daughter’s favorite was the Shitake mushroom chips, yes it is true! She is a unique kid, she loves mushrooms so much. She happily munched on this healthy snack. (hey I can’t complain, I am glad she loves mushrooms). She was also a big fan of the sweet potato chips they reminded me of the Andy cap “fries” I used to have when I was little (but a MUCH healthier version that is for sure)I love the taste of green bean chips, they are a break from sweet snacks. My husband loved the sweet pineapple, saying it was the best dried fruit he has ever had. We have never tried taro before.. I have to honestly way we did not know what it was? We found out that it was a blue root veggie, and it is delicious. It works well as a savory chip. We took to mixed veggies and the mixed fruit bags to a trip to grandma’s over the past weekend. My daughter gave some to grandma and grandpa to try as well as her 8 year old cousin. The snacks were liked by all. As a mom I love that my daughter likes these snacks, liking a healthy snack? I have no problems with that, it is a wonderful thing. I will have to pick up some more at our local Whole Foods. I will just have to try the apple and banana snacks. I was also able to try some great sauces, Bourbon chicken marinade, and Bourbon chicken grill & dip. I used the Bourbon marinade last night and made a super easy and delicious chicken dish with it. My family loved the chicken, it had a sweet and unique flavor! And they used the dip to add extra flavor to the chicken as well. What an easy way to make a delicious easy meal. I would recommend the sauces and the chips on the Breezy Spring site. If you are looking for a sauce to “spice” up your dinner, or some healthy snacks for you or the kids make sure to check out Breezy Spring. 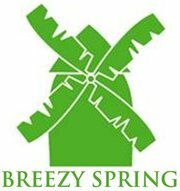 Please visit Breezy Spring store locator to find Harvest of Heaven and their other great products near you. They are having a Thanksgiving discount promo on Alice.com for their sauces. Customers must Like our fb page to see the coupon ($0.75 value) that can be used on Alice.com, and if they share this info with friends the value is doubled. The promo ends on 11/30. Check then out on facebook for more information. I just found your blog...I'm your newest follower from the blog hop. 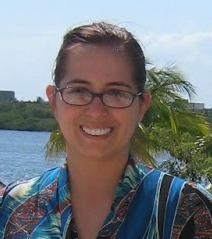 I'd love you to stop by my blog & follow along too! Cute picture of your little princess..SO cute. It reminds me of my little girl who LOVED Cinderella. She is now 10! Time goes too fast!